EPISODE 1- "RING OF DESTINY"
Jonas Lawson, a petty thief, gains superpowers from an alien ship that crashes down on Earth. 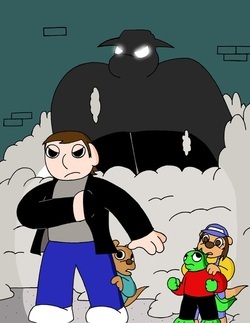 Now an unstoppable force, detectives Honzy and Joel will need extraterrestrial help if they hope to defeat Lawson before he destroys the city. How did Honzy and Joel meet? How did Alien Town get its name? What was the origin of the alien ring? These questions and more are answered in the exciting second issue! Plus, a new ally appears on the scene! EPISODE 3 - "SMOKE SCREEN"
A regular day in Alien Town turns into chaos when an apartment building becomes a towering inferno, trapping several people inside, including Honzy and Joel. Will they be able to save the victims and themselves in time? What is the REAL story behind the blaze? 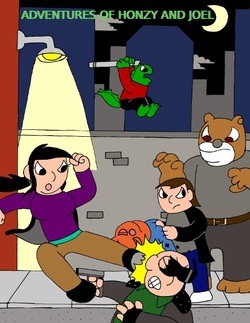 The Kragon Detective Agency, despite still recovering from injuries during their previous adventure, are called into action against a new threat. A mysterious new villain comes out from the shadows at last and wreaks havoc on Alien Town by releasing some of its most notorious criminals. Who is this new enemy? What are his intentions? 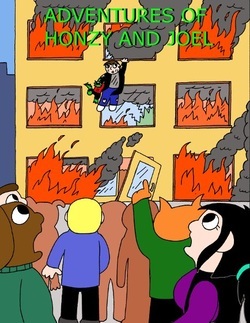 Will Honzy and Joel be able to stop his evil plans? EPISODE 5 - "WAR ZONE"
Alien Town is in chaos! Thanks to a mysterious new villain, Joel and Kara are trapped in the midst of a riot involving dozens of dangerous criminals. 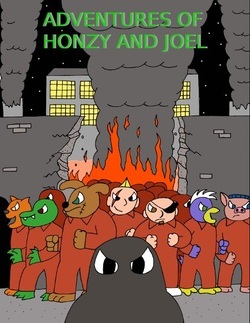 In the meantime, Honzy, Copper, and Claw must devise a plan to rescue their friends and save the city. Don't miss the exciting conclusion to this story! EPISODE 6 - "SHIPS IN THE NIGHT"
In the aftermath of the riots, a dangerous new case leads Joel and Kara into a trap. 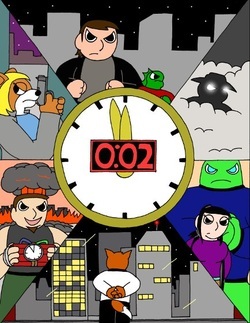 With time running out, Honzy races to find a way to save his two friends. Meanwhile, Joel and Kara recall their first adventures together. It's a story of boy-meets-girl, boy-and-girl-save-the-city in this OVER-SIZED issue! EPISODE 7 - "THE STRANGER"
As the Kragon Detective Agency attempts to track down the source of the recent illegal weapons shipments, an alliance between two criminal masterminds comes to light. 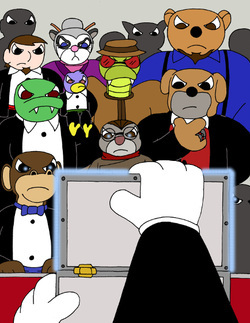 To make matters worse, Honzy and Joel are now in the cross-hairs of a shadowy new foe. Meanwhile, a new vigilante in town known as The Stranger has been striking back at criminals by night. But whose side is he really on? 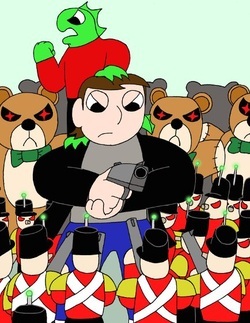 EPISODE 8 - "FUN AND GAMES"
The investigation of an attempt on the mayor's life takes a turn for the weird when a diabolical army of toys begins attacking Alien Town. The Kragon Detective Agency find themselves caught in the crosshairs during one of their strangest cases to date. Who is behind this sinister plot? Can our heroes put an end to the games before it's too late? Honzy and Joel's mission to New Bark City turns into a race against time involving a phantom, a madman with explosives, a ruthless crimelord and more. Can they prevent the worst disaster in the city's history? 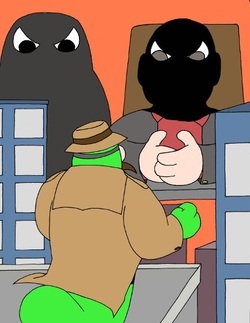 The Kragon Detective Agency goes undercover at a secret criminal auction, only to find more than they had bargained for. Secrets will be revealed, identities will be exposed, and the truth behind all the chaos that has gone on will at last be brought to light. Don't miss this epic conclusion to the first chapter of our heroes' amazing adventures! EPISODE 11 - "A NIGHT TO REMEMBER"
Honzy, Joel and their friends narrowly saved the world…but not without a price. Reeling from the events of the auction, they have decided to take a night off. As Joel and Kara spend an evening together, the others end up in a showdown with their nemesis. Romance may be in the air but there will be mayhem in the streets! EPISODE 12 - "CRASH COURSE"
The past and present collide as new information about the artifact comes to light. When Honzy’s driving exam turns into a dangerous high speed chase, chaos ensues at every corner. Will this white knuckle ride turn into a crash course? EPISODE 13 - "NIGHT SHIFT"
The Mayor of New Bark City's children have been kidnapped, and our heroes have only a few hours to save them! It’ll take all their skills plus some supernatural help if they hope to survive the city streets after dark! EPISODE 14 - "EYE OF THE STORM"
EPISODE 15 - "NO CASE TOO SMALL"
EPISODE 16 - "TURNING THE TIDE"
​The Kragon Detective Agency resumes the manhunt for the villainous VanDroth, but then find out that another organization is out to capture her as well. Though their nemesis has been steps ahead so far, our heroes are closing in. Will their new competition help or impede their mission? EPISODE 17 - "HIGH STAKES"
Honzy, Joel and Kara are participating in a Halloween charity event when trouble comes up. It's up to Honzy to quickly save the day in this mini-adventure! To honor the 5th anniversary of this series, I released the first five issues in one exciting book! 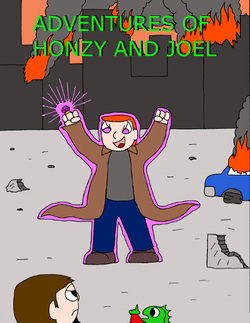 Join detectives Honzy and Joel as they battle criminals with cosmic powers, survive a towering inferno, save their city from a mob of psychopath criminals on a rampage and much more! To honor the 5th anniversary of this series, I released Episodes 6-10 in a single exciting book! The Kragon Detective Agency’s latest cases lead to them facing off against killer toys, men with superhuman strength, mad bombers, supernatural entities and more as they find out the truth behind the chaos going on in their city! 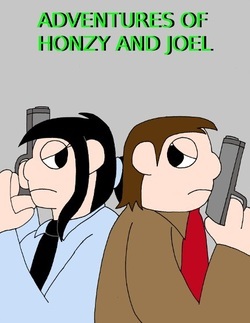 To commemorate the first five years of being published, I released Season 1 of “Adventures of Honzy and Joel” in one complete volume! Features Episodes 1-10.